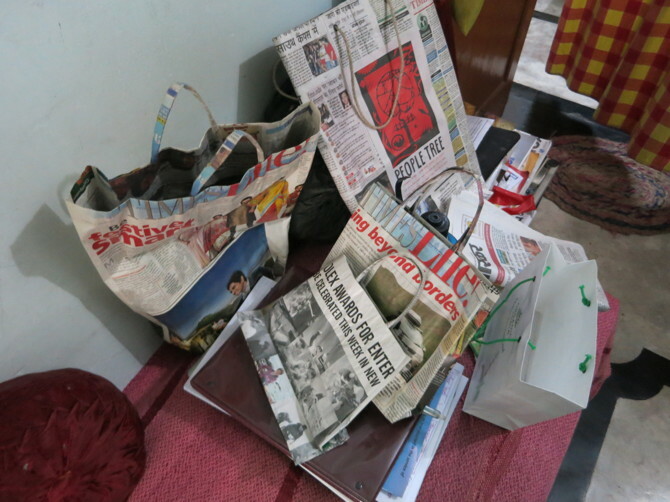 Innovation in action: Bags Pradeep folded out of newspaper. They use an ingenious weight bearing strategy. I had trouble getting to sleep and waking up. I just wasn’t the right kind of tired. I had breakfast, started in on some writing and then started to calculate deadlines for the different “deliverables” of my internship (A guide to OASiS-style thinking, a detailed flow chart for the McMaster Social Innovation Lab and an example problem). I realized there was not a lot of time and I wanted to do so much. In that moment, I catapulted into another stage of this experience. I had settled in, and now I was ready to pick up speed. I felt the stress in my chest – the good kind, the kind that makes you feel alive. I started planning and writing. I dove in. I shared my concerns and excitement with Pradeep. I told him that I thought my time at the Museum School was coming to a natural end. I was going to teach the students something new today, an exhibit they had not seen before. We had come a long way from our first day of me repeating Hindi words back at them. I thought that I could spend time in the afternoon writing instead. Pradeep suggested that I fold my third objective into my time at the museum school. I could work through a problem there and develop a solution. Based on my interest in the well-being of differently-abled people, he suggested I think about how the museum school style of teaching could be adapted to allow them to learn. Did it have to be adapted at all? There were a few children currently coming to the museum with learning disabilities, he said. I could try to teach them in a similar way as I had been interacting with the other students – lots of pictures and gestures. From that starting point I could think about how these children (or adults) could be integrated into the school. I liked it. I would not have to sacrifice learning by experience for the sake of completing my tasks. Tomorrow, I will start working with a smaller group of children. Then, we talked about bandwidth, the idea that you can do anything you want, but not everything you want. How do you know when to pull back and how do you pull back? Pradeep showed me a folder on his computer filled with “social innovations” he does not have time to pilot himself. He told me that for a while he tried to do many things himself, but it was too much. “You’ll know when,” he told me. Now, he has changed tactics. He tries to find people to join him on his quest (people like me) and shares these ideas with them. Pradeep showed me a folder on his computer filled with “social innovations” he does not have time to pilot himself. He told me that for a while he tried to do many things himself, but it was too much. “You’ll know when,” he told me. Now, he has changed tactics. He tries to find people to join him on his quest (people like me) and shares these ideas with them. I told him about the project bank the McMaster Social Innovation Lab wants to maintain – a storage place for these ideas that is open to all. We talked about the importance of visual reminders to think differently. He showed me another folder on his computer for pictures of innovative ideas – from a beach mural on the wall of a prison cell to a bamboo body brace for carrying heavy loads on one’s head to a “kitten” pizza (Don’t worry. No kittens were harmed in the making of the pizza. It just had a kitten face on it). Shibani was in the other room, writing the script for the Museum School’s annual function (showcasing the five roles of a woman, with the goal of uncovering prejudice and encouraging respect). When we had lunch, she read us a scene about dowries. Then, we were off to the Science Centre. Today I had free reign of the museum. I tried to explain the extinction of the dinosaurs, the Coriolis effect and atmospheric pressure to the children. It was a decent success, though I suspect that they had already had some of it explained to them.